1 Benefits from the Fab bag. 2 Benefit of subscriber with the Fab bag. Beauty and makeup has always been twinkle of every woman’s eye. It was my birthday and just like all woman, I like myself being treated with gifts. I wanted to gift myself something special on this birthday and the Fab bag monthly subscription beauty bag got clicked in my view. I was just enthralled and immediately booked the 6 months subscription as a gift to self. I was a bit disappointed later on, to know that Fab bag is delivered on 20th of every month and my birthday falls on 11th August. At this point, I would request Fab bag team to organize a special delivery for some special occasions. I would not call this as Fab Bag review or review of any products, but it is sharing of an experience with a company. I have expressed my honest opinions on the products that I loved and the lovely bags those are now part of my handbags to channelize items in the purse. Finally, the day arrived, when I had a courier at home and just like all woman, I was very much excited to open it to know, what’s inside. This thing continued for 6 months. 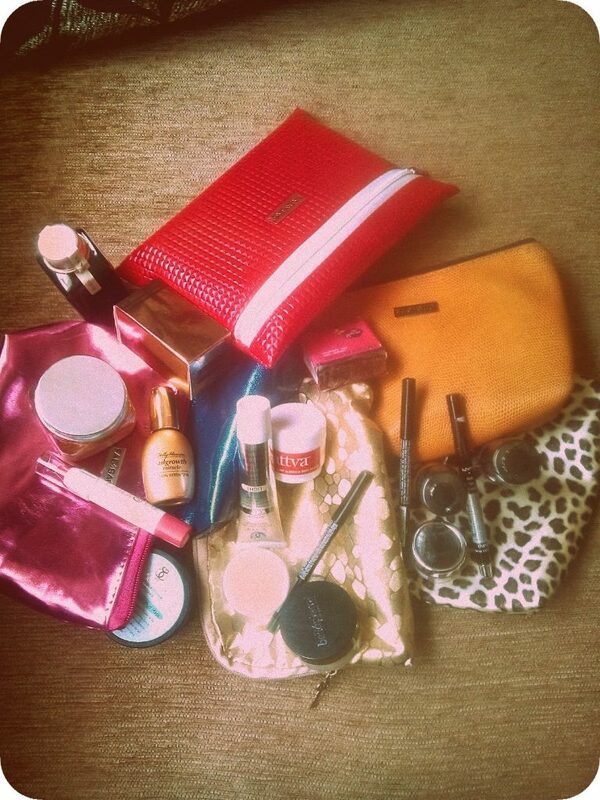 Every month a lovely bag with some lovely beauty products in it, became my habit to receive it. 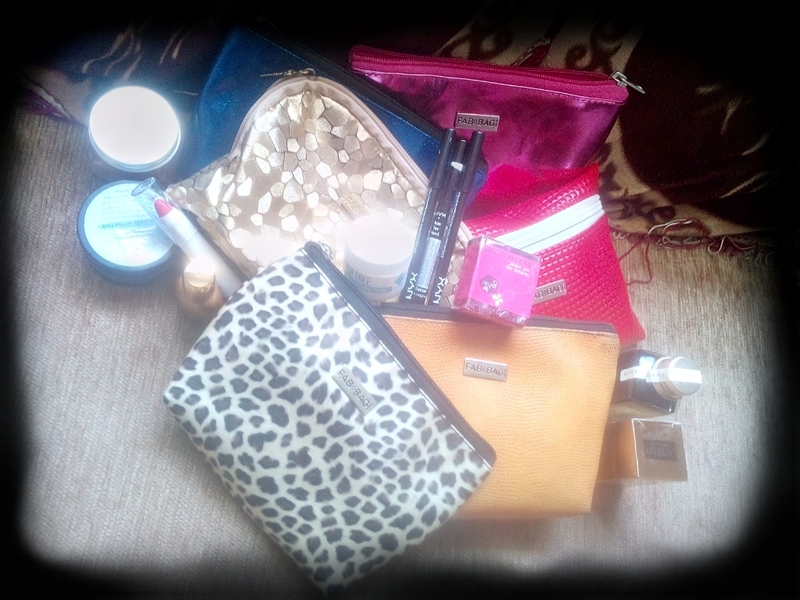 Though I am a bit lethargic to use beauty products, I loved to receive the bag. Benefits from the Fab bag. With the Fab bag, every month I was receiving sample of good products, which I can try, review and then buy the full pack. I was a bit skeptical about using hair products so I kept them pending in my kit. One fine day, I felt the need of using them and to my surprise, they were so good. Benefit of subscriber with the Fab bag. I have become a regular user of some beauty products about whom I was skeptical earlier. I am using totally natural shampoo on a regular basis, but that fine day, I forgot to get one and my shampoo bottle was finished. Wella Enrich Shampoo came to my rescue. I was bit skeptical about using non-natural product, but too my surprise, it left my hair completely nourished, soft and smooth. I loved the end result and to top it all, no hair fall. After the sample bottle was over, I wanted one so eagerly that I got Wella Enrich from local market. But I was cheated, the moment I took the shampoo in my palm, I got that the texture of the shampoo is completely different from the one, I have used of the original shampoo. To my regret and just like an alarm of the morning, I realized that I could have got the shampoo from the Fab bag online shop and there I don’t have any chance of getting cheated as they directly get it from the manufacturer. If you have any sort of complain from your hair then this one is for you. A perfect intensive hair treatment – Bringadi. I am totally in love with this product. I will call this as a miracle product, which actually sorted out dry hair issue and gave it a nourished look, when I used it only on my scalp. The small sample bottle served me for 3 times that was a surprise for me and that too, giving very good results. One more product which I loved from my beauty bag was Sea Soul Dead Sea facial mud mask. That black mud mask gives a tantalizing itching sensation on skin on application and after removal of the mask, I felt a skin so fresh, just like the one treated with Facial. I have made it a point to use this mud mask on special occasions and while going out for special evenings. The Sea Soul CC cream is light on my skin and gives a perfect evening look. I wanted Bellapierre Mineral foundation for a long time now. It is worth purchasing to get a special look on special occasion. With the supply of samples, people like me, who are skeptical of purchasing some products can get a chance to review them and then purchase. In case of such wonderful products that I have mentioned, there is a chance of building a permanent online customer base for your products onlinet through Fab bag. Though I have mentioned few products, which have found permanent place in my kitty, there can be many other products for whom other fellow females swear by, so over all it’s great deal for all. I love the lovely bags every month, I get from Fab bag. Above all, they have made my festive seasons great with some gift in Diwali, a tea tree candle, some chocolates and face mask in Christmas (which my son took it as a special gift from Santa for him), the scarf (which I never liked ;-)) and above all the honest approach. I remember the month, when lenses samples were being distributed and as I am having completely number free eyes, I was not expecting anything, but too my surprise Fab bag and the vendor of the lenses (sorry I forgot the name) sent me a NYX auto eye pencil that brought a smile on my face. That’s a very genuine review I’ve ever came across for any website yet. Wonderfully done, Twinkle! Thank you so much Mancy.. Keep reading..